Volkers DHI's are mod, don't you need to tweak for 17.5T blinky? Thanks i'll give that a go . Who can supply bd5 parts to the uk fast? Does anyone know who has the BD5WXC in stock ? Some shops have the WX, others have the WXi, but I haven't seen the WXC anywhere. u need the kit that come with yokomo lipo ? I don't need the LiPo, but I don't want the "i" version (which I believe has a stiffer chassis plate for carpet racing). so basically you need a WX with a DCJ front ?? why is there such a short supply of kits ive been looking everywere for a WX but can find one. 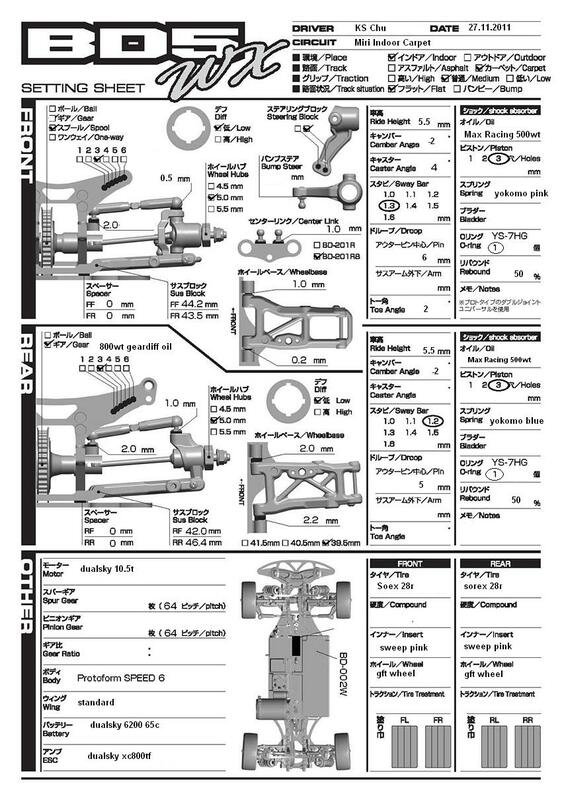 The new Yokomo BD-5 will be available late March/early April. I will have details of the new car very soon. I am also please to announce along with this new car, a entirely new business entity that will take over distribution of Yokomo products in the US, Yokomo America. Yokomo Japan has just confirmed our distribution rights of their products here in the US, and we will be supporting all the new vehicles that are currently available, including this newly announced BD-5 touring car. We are still in the early stages of setting up, but we should be fully operational by mid-March. And we will be taking pre-orders on this new car once we get our e-commerce site fully operational. Some of you might recognize my name in association as the owner my previous business (Speed Tech R/C) and it is through our great relationship with Yokomo Japan from my previous business that they have entrusted me with now distribution of Yokomo products for the US market. I look forward to serving needs of loyal and new Yokomo customers. I will be posting details of the new BD-5 shortly. Thanks everyone. Was this an April fool's thing? Was there ever a Yokomo America? No U.S. support as far as I can tell. 3 years have past since that post, the deal didn't work so Yokomo USA never materialized.